Arnold Rothstein | Nobody Move! On this date in 1928, notorious gambler Aronold Rothstein lost his biggest bet. When Rothstein, thought to be the brains behind the 1919 World Series fix, showed up at room 349 at the Park Central hotel in Manhattan, he was greeted with a bullet to the abdomen. The shooting was allegedly motivated by an unpaid gambling debt. As the story goes, Rothstein–the ultimate gambling fixer himself–thought that the poker game where he lost three hundred large was rigged. As a result, he balked at paying. Another theory has it that the Rothstein hit was perpetrated by rivals looking to take over his rackets. Either way, Rothstein died a couple days later. He refused to name the shooter, and no one was ever convicted of his murder. The case remains officially unsolved. “Say it ain’t so, Joe.” On this date in 1919, the Chicago White Sox lost game eight of the World Series to the Cincinnati Reds, 10-5. This gave the series to the Reds, five games to three. Of course, losing a baseball game isn’t a crime. Unless the game was fixed. 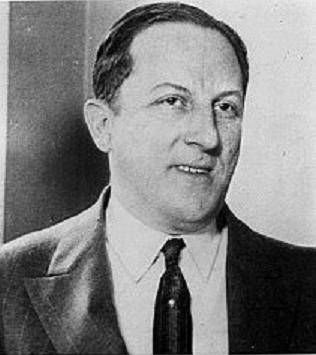 And this one was, reportedly by NY gangster Arnold Rothstein. 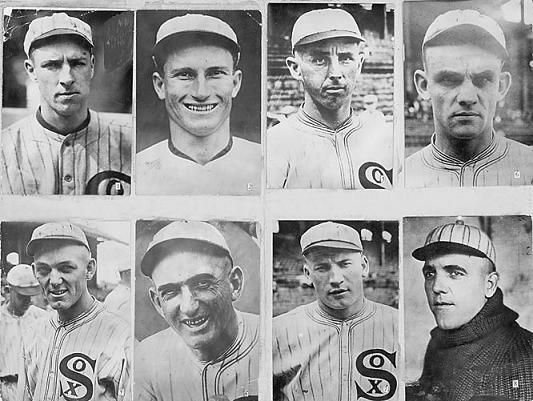 Eight of the Chicago White Sox players – dubbed the Black Sox – were banned for life from baseball.